banaras ka khana: apple and pumpkin spiced cake.. I had never intended to share any baking on this blog of mine as the purpose of Banras Ka Khana is to revive all the desi traditional recipes . Time to time i am tempted to write about the odd cake or brownie the way i like them . There are millions of cake recipes on the internet and there are blogs and websites dedicated to baking . I always look up to these blogs and websites when i want to make the best chocolate cake or an angel cake . I don't wish to post those recipes here but whenever i make something unusual and am pleased by the results , i feel like sharing it here. Mix the dry ingredients and keep aside after sieving them all together to aerate the mixture..
Pour oil a large mixing bowl , add sugar and then the eggs . Whip the mixture well till everything is homogenized . Add the applesauce and mix lightly . The applesauce i used was quite thick and i spooned it into the batter so some chunks of applesauce are there in the baked cake. 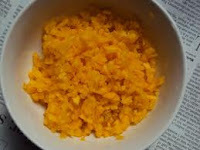 Add the grated pumpkin and apple , mix well and then add the flour mixture and fold in lightly . Do not whip after mixing the flour mixture. Pour the batter in greased and dusted tins and bake in preheated oven . 180 degree C for 45 minutes . Check with the help of a skewer and cook a bit more if needed. I like something handy to serve... something rich , moist and sweet . Thanks Priya..that was a quick comment. Yes , this cake is a favorite , appreciated by many friends and i made a healthier version recently too . Coming soon. Wow so delicious i need them .. Wow!! This looks amazing. I am terrible at baking!